If we view entrepreneurship and owning and running a business as a means of delivering value to our customers and our staff, we also need to realise that all starts and ends with self-improvement. Your growth and the growth of your business are directly aligned. Understanding and developing yourself is an ongoing process of personal growth which plays a vital role to achieve our fullest potential. And it’s a constant road of discovery. The one I’ve personally been on for the last 20 years and plan to be on for the next 20. I’m a firm believer of the more I know and understand myself, the more capable I am of identifying the areas in which I want to continue to grow, both professionally and personally in order to achieve the goals I set for myself and my business. As I continue to challenge myself through every stage of my journey I am continually identifying the skills I need in order to achieve my goals and ultimately fulfill a higher quality of life. Constant personal growth also establishes our abilities to be resilient even when we are in difficult and challenging situations. 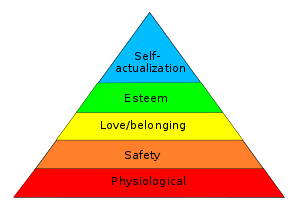 According to Maslow’s hierarchy of needs, we all have an inbuilt need for personal development which occurs through a process called self-actualization. It refers to the desire of becoming everything that we are capable of becoming. Starting and running your business needs to come from more than just having a great idea. You need to be willing to push yourself outside of your comfort zone, challenge yourself and your knowledge, know and understand yourself and more importantly, know and understand your target market (you know, the people making the decisions to purchase from you). A key ingredient to your success. If you know and trust yourself, your clients will do the same. If you project yourself as confident and a leader in your industry and successful then your clients will also view you in this way. Is this an area you are currently growing and developing? COULD this be an area you can grow and develop? To position yourself as an expert and gain credibility, you need to continue to learn skills that can make you better at what you do. Make reading or listening to podcasts a regular habit. Attend information sessions, seminars, workshops and training that will increase your knowledge and give you ideas about strategies that can help you and your business. Use your time wisely, stay on top of information and the latest trends in your field of expertise so that you can quickly spot opportunities which could help you stand out and grow your business. Most successful entrepreneurs and business owners work with mentors. Someone they look up to who have already achieved what you aspire to do. Mentors can also help you to identify and avoid potential problems and mistakes that may lie ahead. Masterminding with mentors, or anyone who is just ahead of you is one way to fast track your success. Working with a mentor on a regular basis can also give you options to connect and network with new people, and can give you the advice you need to speed up the growth of your business. Your habits are the key to a lasting change in life. In order to develop excellence, you need to adopt winning habits that will, in turn, become your way of life. Developing good habits in attitude around resilience, persistence, and consistency are required to not only reach your goals but will become a very important part of your overall success. Sometimes we can become complacent with our skills and our knowledge once we’ve mastered them, giving us a sense of comfort and security. The reality is though, it’s dangerous to stay feeling this way for too long as we start to miss opportunities for growth. Stay focused and frequently visit the reason “WHY” you started your business so that you can always fire up your motivation to grow and develop yourself further. When you are in a place of passion it’s naturally easier to stay focused and will also help you to connect with your customers in a way that speaks their language, helping your business to thrive. So win-win really. Start to value your time, and more importantly, stop wasting your time. Time is one of our most valuable and precious commodities. The more value YOU place on your time, the more the people around you will also value it. Learn to be more productive and focussed on spending your time doing the right activities for you and your business, and increase your profits by doing so. There is no time like the present, now is the perfect time to invest as much time into your personal growth as you do to the other areas of your business so you’ll be able to reap the benefits of your newly acquired knowledge, contacts, motivation, and habits, helping you to accelerate the growth and success of your business. As always, if you’d like to know how I can assist you with this shoot me an email or give me a call so we can chat.